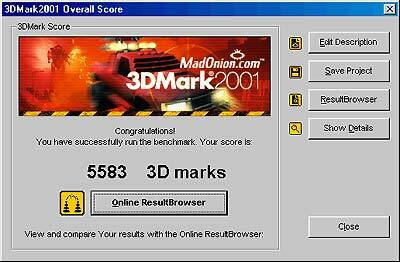 While the 3DMark 2001 scores did increase along with the processor's speed, it's also no secret that 3DMark likes a high speed bus. The jumps in the scores can probably be attributed more to that then a raw increase in prowess from the MHz. While I was quite impressed with the Iwill BD133 overall, there are still quite a few glaring flaws with the board in my mind. First, the ridiculous positioning of the floppy drive connector, I don't know who thought of that, but not a good idea!! Secondly, and most importantly, the current version I am reviewing isn't capable of running the new Tualatin Pentium !!!'s. Anyone buying an i815/E/EP chipset based motherboard right now are going to hit a dead end at the 1.0 GHz coppermine Pentium !!!'s. Still, if you are going to buy an Intel based board in the immediate future (for whatever reason you don't want to wait) then give the Iwill BD133 a look... You certainly won't be disappointed by it's performance, or low price point.